This is another guest episode. When Hye Sung was on the show talking about charismatic gifts, we mentioned our good friend Elijah a few times. Elijah is a student at the same Quaker seminary Micah attended: Earlham School of Religion. Through Quaker Voluntary Service, he was a pastoral intern at West Hills Friends Church a couple years ago. Now, he’s working on starting a new LGBTQ+ affirming Friends church in his hometown of Jonesboro, Arkansas: Solomon’s Porch. Last time, talking with Micah about centering, Mackenzie said she uses intercessory prayer to center. With Hye Sung, we also touched on intercessory prayer in terms of miraculous healing. Mackenzie has come across someone saying “Quakers don’t pray,” so, this time, we’re going to look at different types of prayer. A common phrase used especially by Liberal Quakers (but also sometimes others) is “holding you in the Light.” (Or holding someone else in the Light.) Some people really like this phrase because it doesn’t imply that there’s a God. Others use it as simply Quaker-ese for “I’m praying for you.” Some people aren’t a fan of it for strictly theological reasons. Others aren’t fans because so much religious language says or implies “light is good, and dark is bad” and what that can say about race. Some people hold in the Light by visualizing a glow around a person. Others use words. Praying out loud seems to be really uncommon for Liberal Quakers. Programmed Friends aren’t strangers to praying out loud. Conservative unprogrammed Friends aren’t either. They have a tradition of kneeling (and men removing hats) when praying during meeting for worship. Elijah is one of Mackenzie’s dearest friends, and she can barely bring herself to say a few sentences of out-loud prayer in front of him. We talk about the upsides of praying aloud in a group. Elijah gave us fancy seminary vocabulary words. Cataphatic prayer has words or pictures or sounds or feelings. When you envision someone illuminated by the Light, that’s cataphatic. When you pray “God, please take care of my friend,” that’s cataphatic. On the other hand, apophatic prayer is self-emptying. It’s an empty space for God to fill. We think meeting for worship is a type of apophatic prayer. We discuss the idea that a major effect of prayer is changing the person who’s praying. Kierkegaard said it as “prayer does not change God, but changes him who prays.” The Epistles of James says you have to do the work to help a person when you pray for them. By praying for someone else, we become less self-centered. Elijah talks about praying vulnerably and being able to be more vulnerable with a friend. If there is anything you would like us to pray for for you, please let us know in the comments. Mackenzie: Welcome to Quaker Faith & Podcast, where we will explore traditional Quaker beliefs, and the variety of Quaker beliefs found today. 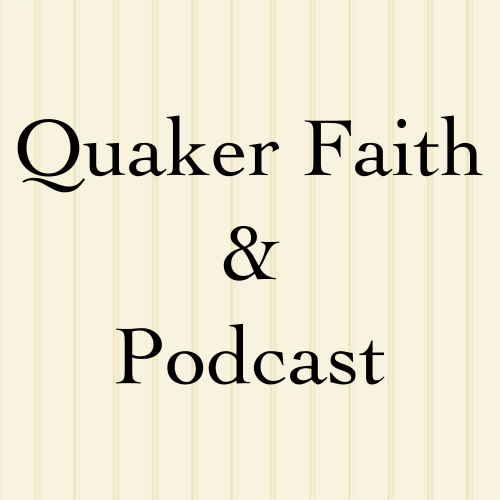 Welcome back to Quaker Faith & Podcast. Today, I’m here. I’m Mackenzie. I am here with a guest, my friend Elijah. Say hello. Mackenzie: You may recall that I mentioned Elijah a few episodes ago when we had Hye Sung on as a guest. We talked about our good friend Elijah. This is that Elijah. Would you like to introduce yourself? Mackenzie: Oh, I guess do you want to say the name of the church maybe? Elijah: Oh, yeah. The church is called Solomon’s Porch. Mackenzie: Okay. I think when we Hye Sung and I were talking at one point we sort of lightly mentioned intercessory prayer, especially … I think it was when we were talking about healings. Last time with Micah, when we were talking about centering, we … well, I said that the way I center now is that I’m doing intercessory prayer and then when I run out of words, I’m centered. But I’ve also encountered people say … I don’t remember. When I watch social media, Facebook, Reddit, something along those lines. I remember somebody saying that Quakers don’t pray, which made me go, “Huh?” But I realized that could be that they’re talking about a specific form of prayer as being something that at least unprogrammed Friends would not be engaging in. This time we’re going to talk about prayer and Quakers and intercessions and those fun things, and, look, I found a seminarian to chat about it with. I think for liberal Quakers, the most obvious intercessory prayer thing would be we have a little phrase of, “Holding you in the light,” and that means different things to different people. Do you wanna … ? Elijah: Yeah, I think it does mean different things to different people. I was a pastoral intern at a semi-programmed Friends’ meeting in Portland, Oregon, for a while. Mackenzie: I’ve mentioned West Hills Friends on here before. Elijah: Right. West Hills Friends. And we regularly used that phrase, “Holding you in the light.” For the people that were not necessarily Christ-centered that was definitely a sort of imagery. They would sit in prayer or meditation and imagine the person being illuminated by the light of God or the light of the world. For others, it’s really just a phrase that means they’re praying for you, using words in the way that other Christians might pray. Mackenzie: I know I’ve seen … Isabel Penraeth, whose website was quakerjane.com. She had a glossary entry for holding you in the light where she said that … well, she quoting somebody else, but she was saying that you can’t just hold somebody there. It’s not a place where you can go and put someone. And then also like Maggie Harrison I know has a rant about how the light is an uncomfortable thing that shows you your imperfections. Elijah: And then there’s also an argument that I’ve heard a lot in seminary, especially, that says that how we use language around light and dark or good and bad implies a lot to people of color, especially. If we equate light with good and dark with bad, then what are we saying to our Friends of color? Mackenzie: Right. Yeah. I’ve heard that before too. Elijah: Yeah. It’s pretty common for people who feel that way to not use the phrase ‘holding you in the light’ but to say, “I’m holding you in prayer,” or, “I’m holding you in my heart,” or, “I’m holding you in mind,” or something else like that. Mackenzie: I know in my meeting, which does not quite meet the 80% for multicultural, but it’s closer than any of the others in Baltimore Yearly Meeting. We say, “The light of God’s love,” when we’re doing joys and concerns, instead of just saying, “The light,” so that it’s clear that we’re talking about as in what a candle puts out. I guess … okay. I said that some people say that Quakers don’t pray and I think those sort of form that … I mean, there’s certainly like out loud with words prayer is a form that is just weird to me as a liberal Friend. I mean, every other branch I know does it. The conservative Friends, they’re unprogrammed and they still do out loud prayer. They actually kneel when they pray out loud. In meeting, if somebody’s offering ministry, they stand. But if they’re praying, they kneel, and usually the other men will take off their hats because prayer is happening. Mackenzie: But for me as a liberal Friend, something that has been weird hanging out with you and Hye Sung and Micah is that you all say prayers out loud. Elijah: Yeah. Generally, when I’m praying with others, the way that I like to do it is to center in silence and to let my prayers rise from the silence like vocal ministry. But other times, I like … I attend this worship group that’s not Quaker and someone just asks me to pray and … today, when we were closing the meeting together and I felt caught off=guard because someone was just asking me to pray out loud and we hadn’t been sitting in silence for a while and it wasn’t just rising naturally from me. That was a really interesting experience. Mackenzie: I feel like the only way that I could do that would be just reverting to all the prayers as a Catholic, like reciting the Lord’s Prayer, or like Grace, right? Like, “Bless us, oh Lord, and these thy gifts which we are about to receive from thy bounty through Christ our Lord. Amen.” Right? I can rattle off childhood Catholic prayers, but … yeah, if somebody asked me to just say a prayer now, I’d be like, “I … what?” But I think I kind of felt like that when … actually, when you and I first met because … For those listening, I actually know Elijah through Micah, well, and through Hye Sung. Both. Mackenzie: Because Hye Sung told Elijah and I both about an event Micah was hosting and so that was how we all met. But at that event, there was like a praying time and one of the organizers there was really insistent that we pray out loud rather than just say what we wanted to pray for and letting everybody either visualize a glow around the person, which is what some people do when they say, “Holding in the light,” or use words instead our own heads. It was like, “We wanna pray out loud so that we’re making sure that there’s …” I guess they wanted to make sure that sort of the prayer intention was sort of being sufficiently covered, because I know certainly in my meeting, we have a persistent problem of … that the amount of time left between isn’t really enough to … if you’re actually using words for your prayer instead your head … to like get more than like half a sentence in there. Elijah: Yeah. That’s totally fair. Yeah. I think that something that’s really pleasant about praying out loud is that it helps us stay focused on what we’re doing. Like you said, sometimes there’s just not enough time between prayer requests that are shared, joys and concerns that are shared, but sometimes when someone shares a request, it’s like we can go off thinking about other things or even just worshiping in another way without really focusing our intention on the person who has requested prayer. Praying out loud kind of directs the attention to that person and their needs. It really, in some cases, I know that it comforts the person who’s requested prayer to be prayed for out loud. Mackenzie: That’s a good point. Okay. You said that you specifically wanted to talk about two different forms of prayer with really fancy seminary words about them. Mackenzie: Whereas at some point in this, I should mention … because we’re focusing on intercessory prayer, but at some point, I should mention the other three types. But go ahead and tell us about apophatic and kataphatic? Are those the words you said? Mackenzie: So, we’ll go with the A-word and the C-word. Elijah: So, apophatic and kataphatic prayer. We talk a look about this in seminary. Kataphatic prayer has content. It uses images, words, symbols, ideas, or sounds, and this is primarily how people practice intercessory prayer. We ask God to intervene or intercede on behalf of the person that we’re praying for, and we do that by using words, whether out loud or silently to ourselves. That’s true for people of faith across many branches of Christianity, not just Quakers. In intercessory prayer, we’re asking God to heal or to provide in material ways. Mackenzie: It sounds like we actually do a lot of that one. Mackenzie: Like [crosstalk] for worship. I mean, that sounds like you’re describing waiting worship or at least, it’s … yeah, that seems like waiting worship maybe is a type of that. Elijah: Yes. Yeah. I would say that that’s true. That it is a type of apophatic prayer. But I also believe that apophatic prayer can be intercessory prayer. There’s something about sitting with other believers or other Friends with the intent to pray apophatically without images or sounds or words … something about that experience of inviting God to just rest with us that leaves us … well, when we leave that space, we leave changed. Even if we’re not using words and images to pray for the person sitting next to us or for ourselves, just that act of sitting with someone and sitting in God’s presence together, that invites God to change us. I believe that that is a form of intercessory prayer, but it’s more about trusting God to know what we need without using words and images to tell God what we need. Mackenzie: Okay. I like that explanation and the part about trusting. I’m trying to remember … there was something I thought and then I forgot it. Mackenzie: It’s not your fault. This is the ADHD brain. It thinks of all sorts of things and then forgets them, and … Oh, here’s why I forgot, because earlier I recited the Catholic grace, which is an intercessory one because it’s bless us and bless gifts. And then I thought of the other form of Grace I know, which I learned in Girl Scout camp, and is to the tune of the Addams Family and … and rather than being an intercessory one, it is a thanksgiving one because it’s we … It’s (singing). So, welcome to my childhood. Elijah: Yeah, I used to go Presbyterian church where they prayed to the tune of the Superman theme. Mackenzie: It didn’t know it had a theme. Elijah: Yeah, I could not … I couldn’t sing it again, but … yeah, it was interesting. Mackenzie: And now I just remembered my mom getting in trouble in Catholic school because she was told to lead Grace and she said, “Father, Son, Holy Ghost. Whoever eats the fastest gets the most.” She got a ruler across the knuckles for that one. Mackenzie: Well, I think actually that might be a good point though is that humor is allowed in prayer. Mackenzie: If you believe that God made everything, then God made humor too. Mackenzie: Oh, what about the idea of how intercessory prayer changes the person who’s praying? Elijah: Mm-hmm (affirmative). Yeah, that’s a great question … a great idea. Mackenzie: So, how about I introduce that? Mackenzie: And, obviously, I’m editing out the last minute. Mackenzie: Okay. So, obviously, one major critique you can get of intercessory prayer is like that God is not a vending machine into which you insert prayers and get magic back. Or the very common phrase you’ll find a lot of … especially materialist-type atheists use for God is to say sky wizard, and so there’s … I think that that sort of way of thinking of God and prayer ignores the effect that prayer has on the person who’s praying, and I’m not the first person to come up with that. I’m not that smart or old. There’s a common prayer of, “Give me wisdom,” right? Mackenzie: That’s asking God for advice, basically, and I don’t tend to phrase it that way. I tend to ask God to tell me what I can do about something because … and this is part of … well, you know, but not all of our listeners necessarily do. In the Epistle of James, there’s a bit where James, he’s talking about faith and works and he says, “Show me your faith apart from your works, and I’ll show you my faith by my works,” and he gives the example that if someone is hungry and needing clothes, you don’t just say to them, “Peace, be warm and fed,” and walk away, because faith without works is dead. That if you’re going to pray for an improvement in someone’s situation, then you need to be willing to be God’s hands in that. There’s a poem that is not by Teresa of Ávila. The nuns who study all of her writings, right downtown in Washington, D.C., say it is nowhere in her writings. It doesn’t actually show up until the 19th century. It’s Methodist Guy Mark Pearse and Quaker Sarah Elizabeth Rowntree, but, “Christ has no body on Earth but yours. No hands, no feet …” I can’t recite the whole but … “Yours are the eyes through which God looks out onto the world and is …” encouraging people to do the work as some would phrase it. And especially when you’re praying for someone else that sort of reorientates you in a less self-centered direction. Elijah: I have a bit of a story to share about a time when I was praying for God to intercede in my own life. I had been waiting for sometime to have a surgery that I really needed to have and I couldn’t afford it, I didn’t have health insurance, but I had been desperately needing the surgery for several years and just had to keep putting it off. I found myself one day feeling so desperate to have this surgery that I just wept in prayer and I pleaded with God to make something possible, to make it possible for me to have the surgery that I needed. About an hour later, I drove to have lunch with a good friend, and I don’t know how we got onto the topic, but she asked me why I wasn’t having the surgery that I needed and I said, “Money’s a factor,” and told her how much it cost and I shared very vulnerably with her that I desperately needed this surgery and that I was just hoping for a miracle. And just kind of out of the blue, she offered to loan me the money for my surgery. I could say that that was a direct answer to my prayer, but I think … well, I think that that’s true, but I also think that my prayer very vulnerably God and asking God to step in and help reminded me how to be vulnerable and how to share with those around me what I need, because I think in our society, it’s uncommon to just say, “This is what I need right now and …” Not necessarily expecting someone to be able to help, but just being honest about our needs and wants and desires, and then being vulnerable with people. Being vulnerable with God reminded me of how to be vulnerable with my friend and that meant that she saw my need and was able to help. Mackenzie: Yeah. I remember that story. I know for a little while there, I … about regarding one of our friends, whose name I will not say. For a little while there, I was asking God each night when I would pray to give me ideas for what I could do for them and it was like there were a few weeks of just lots of new ideas for how to help, like popping up, and that was really nice. Catholics typically say that there are four kinds of prayer and that all of them are found in the Lord’s prayer. The Our Father. I find the listing of four a little bit weird because … So, they’re adoration, contrition, petition, and thanksgiving. So, adoration is like praising God, like, “God, you are awesome.” Contrition is asking for forgiveness and then the petition or intercession is what we’ve mostly been talking about, and thanksgiving. The fact that contrition and intercession are both asking for, makes me go, “But why isn’t that just one thing?” But all of those types of things are found in the Our Father, which I guess why that’s the form that Jesus gave in the Bible. It kind of hits all the points. Mackenzie: Actually, I would definitely say that if you were uncomfortable with prayer with word and you want to become more comfortable with it, I think the Our Father is a good one to start with because that’s definitely what I did a couple years ago when I started actually praying again … was like going through the Our Father slowly and actually thinking about what’s being requested in each line or what’s happening in each line. Elijah: Yeah, absolutely. I think that there’s something really special too about reciting the Lord’s prayer knowing that it’s a prayer that people of faith have spoken for thousands of years, and that it was a prayer that Jesus prayed, and … I don’t know. There’s just something really unifying about that, and it reminds us we’re not alone, in addition to all of the great things that Jesus taught us through that prayer. Mackenzie: Okay. 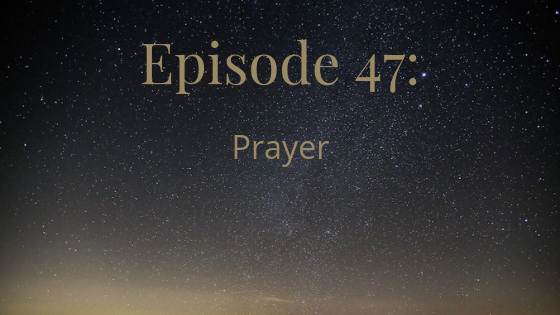 Let’s close this out by asking whether any of our listeners have any requests to hold in the light or prayer requests, joys and concerns. Whatever it is called in your type of Quakers, we invite you to post them in the comments on quakerpodcast.org and I will make sure to poke Elijah so that we both can remember to include those in our prayer practice this week. Mackenzie: You can find us on the web at quakerpodcast.org, as QuakerPodcast on Twitter, Facebook, or Patreon, and on iTunes.